Do you have a state that can be removed when you apply the same state? For example, you use a state that adds a poison state, but when you apply the same poison state, it will cancel out the existing poison state. Download the plugin and place it in the “plugins” folder in your project’s “js” folder. 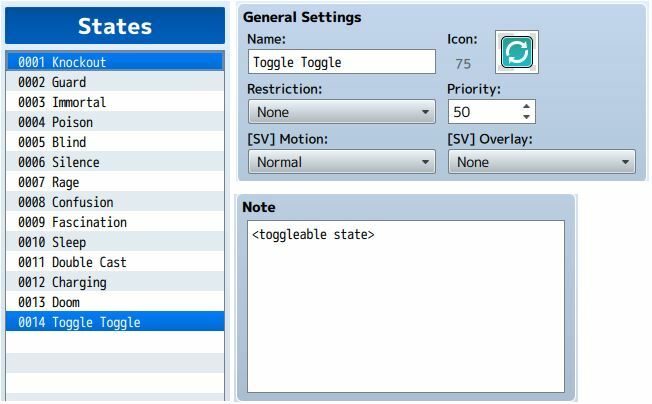 Then open your Plugin Manager (F10), double-click an empty row, and select the HIME_ToggleableStates plugin. Hey I’m having a bit of trouble. I have installed the program as per the instructions, and used it as instructions state, but whenever I reapply the state (using a skill exactly like your toggle skill) the effects aren’t removed. I tried disabling other plugins thinking they were the cause but to still no avail. Try in this test project and see if it works. If it doesn’t work, send the demo to me. Yes, typos can be difficult to catch. There isn’t much I could do on my end to “warn” users that they may have typos unfortunately. It appears that this does not work out of battle. The problem with outside of battle is that by default you cannot use a skill that adds a state to an actor if the actor already has that state. However, because this is a “toggle-able” state, you should be allowed to add them. Therefore I would consider this a bug in the plugin, and have updated it to have those skills work outside of battle as expected. I really love all your work. and I have a suggestion of something that could be nice. Great idea. I think I cane come up with a solution that allows you to “upgrade” a state.